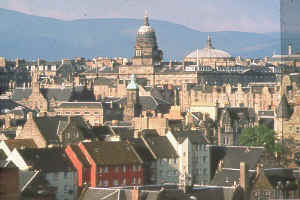 Edinburgh is a city of about 500,000 population, second only to Glasgow in size. 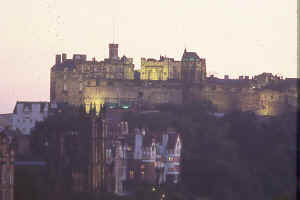 The capital city of Scotland since 1437, Edinburgh is the cultural focus of Scotland. The city is dominated by the Castle, as immediately symbolic of Edinburgh as the Parthenon is of Athens, and one of the most famous castles in the world. 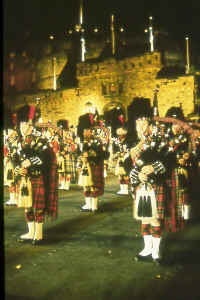 Situated on a towering volcanic rock in the heart of Edinburgh, the Castle's battlements overlook the Esplanade, where the floodlit Military Tattoo is staged in late August and early September each year. Standing on the rock which has been a fortress since time immemorial, the oldest of the numerous buildings which make up the castle today date back to the 12th century. Visitors to the castle should not miss the Great Hall, built by James IV, with its impressive timbered roof. Another part of the Castle houses the crown jewels of Scotland -- the crown, sword and sceptre -- as well as the Stone of Scone -- the Scottish Stone of Destiny -- recently returned to Scotland from Westminster Abbey in London. 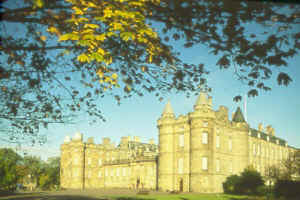 The Scottish Military Museum and the Scottish National War Memorial are also located at the castle, and are open to visitors. The Royal Mile runs downhill from the Castle Esplanade to Holyrood Palace, still an official residence of the British Royal family. Lined with shops, pubs and restaurants, the famous street runs past St Giles Cathedral, the High Kirk of Scotland, where John Knox was the minister. Thirty-nine of the Colours of the Scottish regiments, including those that served Britain in the American Revolution, hang from the pillars of the interior. Further along is John Knox's house, containing various relics relating to Knox. Brodie's Close is where Deacon Brodie, the original of Stevenson's Dr. Jekyll and Mr. Hyde, lived. In the same area is the Writers' Museum which focuses on the lives of Sir Walter Scott, Robert Burns, and Robert Louis Stevenson. In the Canongate area, still on the Royal Mile, many restored buildings reflect the historic character of this area of the city. Adam Smith is buried in the Canongate churchyard. A walk down the Royal Mile ends at Holyrood Palace, dating from the fourteenth century. Built originally by James IV and James V, sacked and burned and rebuilt over the centuries, Holyrood survives today as a royal residence. Visitors today may tour the grounds, and if the Queen is not in residence, visitors can see the State Apartments. Of particular interest is the Royal Portrait Gallery in the Palace, with portraits of over 100 Scottish kings, as well as the house tapestries and other paintings. Mary Queen of Scots lived here for six years. Here she met John Knox; here she saw Rizzio murdered; and here she was married. Prince Charles Edward Stuart held court at Holyrood in 1745, less than a year before he and his Jacobites were defeated at Culloden in the last battle fought on British soil. 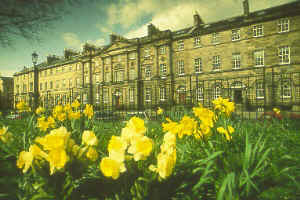 Charlotte Square, in Edinburgh's New Town, is lined with magnificent Georgian houses, and widely regarded as Robert Adam's architectural masterpiece. No. 6 is Bute House, the official capital residence for the Secretary of State for Scotland, and No. 7 is furnished in an eighteenth century setting, and is open to the public. In central Edinburgh are the carefully maintained Princes Street Gardens, below the Castle and running alongside Princes Street, Edinburgh's main thoroughfare. The Gardens include paved walkways lined with park benches, and an open air concert stage used during summer months. Also near the Gardens is Ramsay Lane, a picturesque enclave of gabled and turreted houses hugging the hillside at the east end of the Castle Esplanade. Visitors to Edinburgh who want to research their Scottish ancestry can do so at Register House at the east end of Princes Street. This Robert Adam building is the home of the Scottish Records Office, housing historical and legal records that date back to the thirteenth century. George Herriot's school, a splendid structure on Lauriston Place dating from 1628, was endowed by George Herriot, goldsmith and jeweler to King James VI, the "Jingling Geordie" of Scott's novel, Fortunes of Nigel. The original endowment made provision for acquisition of land and construction of the school for fatherless boys. Opening originally in 1659 with thirty boys, fee-paying students have also been admitted since 1886. 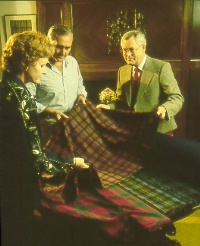 The first girls were enrolled in the school in 1979. While the original building has been carefully preserved, the school has been expanded periodically over the past century. Today students from three to eighteen years old, representing a wide variety of social backgrounds, attend the non-denominational and co-educational school. In 1999, George Herriot's school will mark its 340th anniversary since opening. 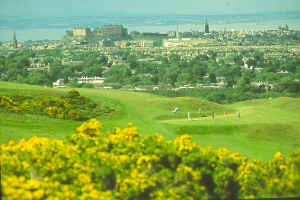 Golf originated in Scotland, and numerous courses are in the area surrounding Edinburgh. Golf was first played on the Old Course in St. Andrews around 1400 AD and the Old Course is renowned worldwide as the Home of Golf. The "Old" has played host to the greatest golfers in the world and many of golf's most dramatic moments. The course is an average of 6566 yards (6004 metres) long from the medal tees. Please send mail to newintel@newintel.com with questions or comments about this web site.